Listening to current Prime Minister Stephen Harper repeat the Conservative talking point that the Liberals, NDP, and Bloc Quebecois will form a coalition if the Conservatives earn only a minority government yet again after the election in May. It’s amazing how on-message the Conservatives have become already: “reckless coalition”, “illegitimate coaltion”, “unstable coalition”, “undemocratic coalition”. First of all, a coalition government is perfectly legitimate within a parliamentary system. Second, remember that Harper prorogued parliament to prevent his party from losing power, which is unprecedented in Canadian history. 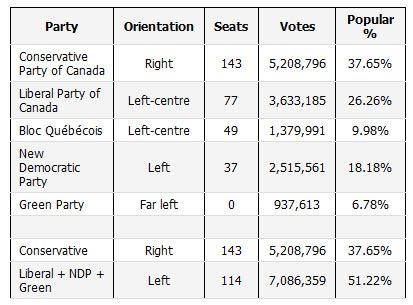 Third, let’s look again at the results from the previous election and ask, would a coalition between the Liberals and NDP go against the votes of the Canadian electorate? As indicated by the popular vote totals, there is little support for the claim that a coalition government between the Liberal and NDP parties in Canada would be undemocratic. However, this represents a very rough analysis because the Canadian system, like many others, is a first-past-the-post process in which the candidate with the most votes is elected regardless of the margin. 1 comment to On coalitions in Canadian parliament. Some form of preference voting should fix that.